The last few episodes of TOTP have been a bit “meh”, in all honesty. There’s been a lot of repetition, not just of songs but of performances, especially evident in last week’s show when only Adam and the Ants and Legs & Co turned up; everything else was videos or clips from previous editions. This week, however, it’s all change – all but two of the songs featured tonight are brand new to the show, including some absolute solid gold musical legends. Of course, nothing in the world of TOTP repeats is ever straightforward, and the presence of one Jimmy Savile meant that BBC Four predictably chose not to bother showing this one again. What’s even more irksome is that presenter “issues” mean that every second episode is being skipped at the moment, with the result that most of these songs won’t make it to air at all. Thank heavens somebody had the foresight to record them all at the time, otherwise this would just be a blank page. Anyway, Savile does one of his “idiosyncratic” introductions which involves him and various audience members swaying enthusiastically to Bad Manners’ Special Brew (careful where those elbows are going, Jimmy) and we’re off and running. “How’s about… we should have… Kool & The Gang… right this second. Thank you.” Yes, Savile is still talking like someone who is learning English as a second (or possibly third) language and can only process… a few words… at a time. 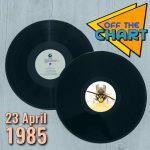 This is the first trip to the TOTP studio for one of the most prolific bands of the decade, performing the third of their eighteen top forty hits been 1979 and 1986. It’s a proper classic too, the band’s only US number 1 and a top twenty hit for Kylie Minogue twelve years later. As with so many bands from this era Kool & The Gang seem to be chronically overstaffed, but they also seem to be doing the whole performance live, lead singer James “J.T.” Taylor – winner of the Least Original Nickname In Funk award for three years running in the early ’80s – doing his best to get the audience in the mood. Michael Hurll really should send out for more balloons, though. 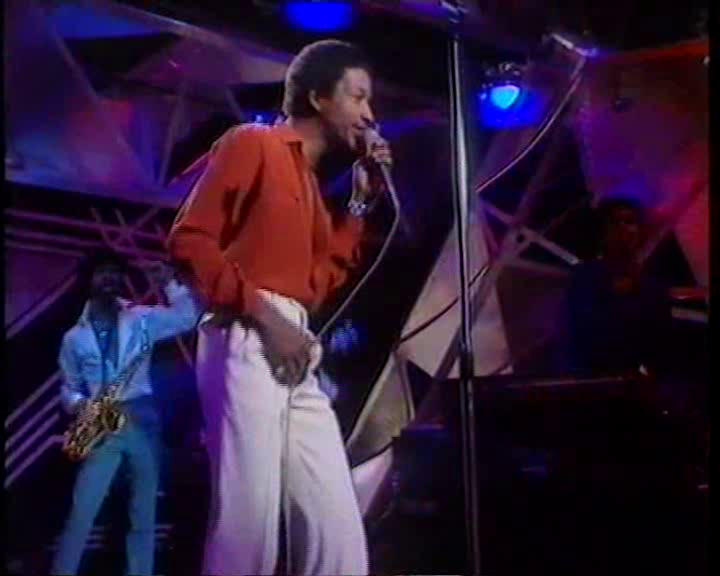 Obviously it’s unfair to expect a man of Savile’s advanced years – even in 1980 – to host an entire TOTP on his own; likewise it wouldn’t be proper to ask Radio 1’s “new boy” Richard Skinner to start doing the show single handed (even though he’s been with the station since 1973 and gained plenty of TV experience as a Thames continuity announcer, and pretty much every other presenter to date did his first show solo, and Skinner’s already been broken in on another Savile episode back in September). And so the two are reunited for a second and final show together, Skinner forcing his way through the audience into shot, still in his regulation newsreader sweater and slacks. Things are changing though, as Richard is about to take over Mike Read’s weekday evening Radio 1 show, in preparation for Read inheriting the breakfast show from DLT in January. Of course Skinner went on to great heights at the BBC; over the next five years he hosted TOTP, Whistle Test, the Radio 1 Top 40 show and of course Live Aid, famously introducing Status Quo as the concert kicked off. Tonight, though, Savile beats him to it and links into another showing of the first performance of What You’re Proposing from a month ago, horrible denim waistcoat and all. “I have got… next week’s… number one record there!” No you haven’t, Jimmy, you’re holding a copy of Looking For Clues by Robert Palmer, who is wheeled on to take part in a thoroughly pointless interview involving searching questions like “When are you going to come back and live in Yorkshire?” Spoiler alert: the single didn’t get to number 1 next week, or ever. Despite this Palmer, ever the gentleman, helps out an OAP by introducing Stephanie Mills. A Broadway star since the age of 9 and recording artiste since she was 16, Mills finally scores her first UK hit at the ripe old age of 23 and celebrates with a walk in the park (Nick Straker Band not pictured). To the accompaniment of a wax cylinder recording of her hit (why did so many promo films sound so bad, even into the ’80s?) Stephanie extols her new found love while crouched down on a path, balanced on a giant rock and even walking past some spiky railings which threaten to take her hand clean off if she’s not careful. The things we do for love, eh? “Wonderful,” enthuses Skinner, who has planted himself in the middle of a gaggle of audience members with balloons and silly hats and proceeds to ruin the party atmosphere by launching straight into the Tedious Music News™. Barry Manilow is coming to tour the UK, but all his shows are sold out, so the point of disseminating this news is unclear. 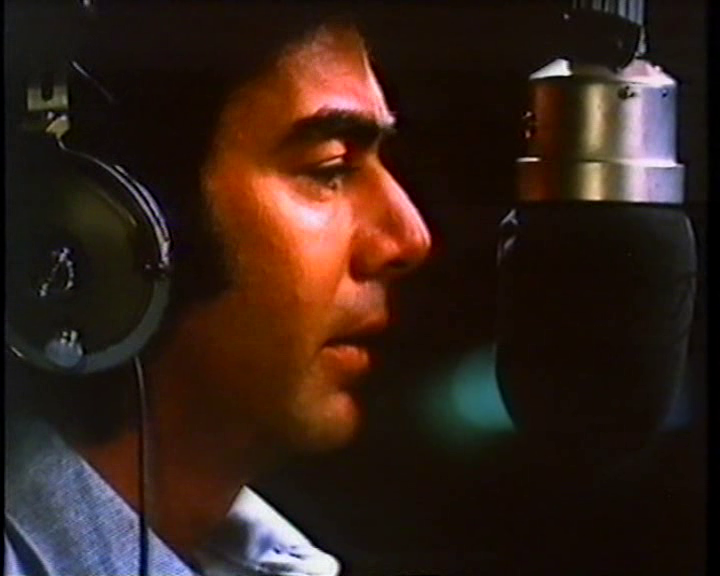 Meanwhile Dexys Midnight Runners haven’t split up, as we’ll find out in due course, and Neil Diamond has made a film. Not just any old film, but a remake of The Jazz Singer, originally a 1927 vehicle for Al Jolson and acclaimed as the first feature-length “talkie”, although in fact the film only includes a couple of minutes’ worth of actual dialogue amongst the songs so really it was more of a “singie”. 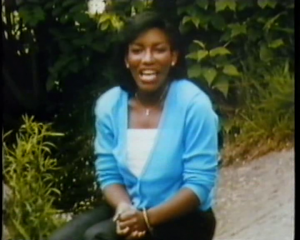 Either way, it still sounded better than that Stephanie Mills promo. The new remake isn’t due out until January but Skinner offers us an “exclusive preview of the film” which amounts to little more than a clip of Diamond sitting in a recording booth singing Love On The Rocks and if that doesn’t make you want to go and see the movie, I wouldn’t be at all surprised. “That’ll be in the charts soon,” predicts Richard, “let’s have a look and see what’s in the charts right now!” The top 30 countup begins poignantly with a new entry at 30 for (Just Like) Starting Over, the big comeback single for John Lennon (and Yoko Ono, as Skinner helpfully points out) and carries on up to number 19 where we find Dennis Waterman whose single has made it into the top twenty a full four weeks after he was first persuaded on to the show to talk about it. 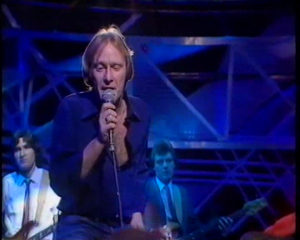 Lest we forget, the single credits “Dennis Waterman with the Dennis Waterman Band”, and what a fortunate occurrence it is that the Dennis Waterman Band met up with Dennis Waterman and persuaded him to become their lead singer, otherwise they’d have had a really stupid name. 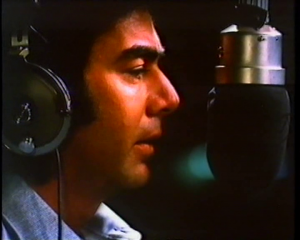 Waterman does at least put in a decent shift, singing the Minder theme totally live and hoping nobody noticed that he forgot the lyrics to the different chorus combinations and just bluffed his way through by singing the second chorus over and over again. No, we didn’t notice. Back to Skinner and the chart countup, this time in an almost invisible dark blue on black, before we dive back down to number 29 and the third single from Roxy Music’s all-conquering Flesh + Blood album. Unfortunately the band can’t make it to the studio due to a recent onstage accident when everyone slipped in the grease from Bryan’s hair and ended up in traction, so instead… enter Limbs & Co! Heaven knows what they’ve come as this week, it looks like some kind of highly impractical gold swimsuit collection but it’s hard to tell through the mess of dry ice and unnecessary video feedback which lends a lovely drug-induced nightmare effect to the performance. Although The Same Old Scene only reached number 12, ending Roxy’s run of four consecutive top five hits, it remains a fan favourite and has been pressed into service for remix purposes on more than one occasion. Oh, look out, Savile’s back, still swaying from side to side long after it ceased to be a thing. “As it ‘appens… ladies and gentlemen… number 25 in the charts… UB40!” Solving the “add some words to form a sentence” puzzle we do indeed find UB40, now on their third hit single, all of them double A-sides and most of them thoroughly depressing, none more so than this one. Named after a 1965 film about an alien invasion, the video for The Earth Dies Screaming finds a terrifyingly young looking Ali Campbell and band throwing up lyrics like “Bodies hanging limp, no longer bleeding,” in front of some solarised stock footage of mushroom clouds. It’s just the kind of thing you want to hear in the run up to Christmas, although we do cut back to the studio fairly sharpish, just as it looks like Brian Travers is blowing a mushroom cloud out of his saxophone. 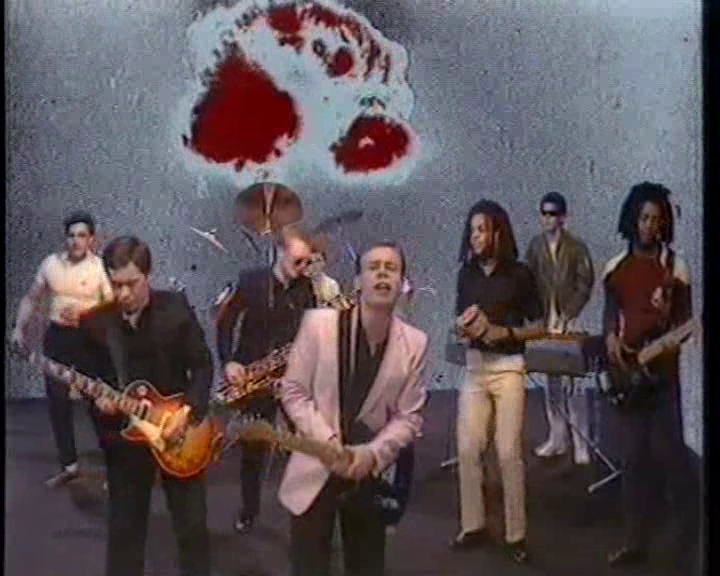 Of course they could have shown the video for the single’s other A-side Dream a Lie which would have carried on the show’s Al Jolson theme nicely. As he recovers the power of speech, we find Savile between two young ladies, “debating”. Yes, you heard correctly, he’s debating whether to give the two girls prizes for being dressed colourfully, which is a perfectly rational thing for a man in his fifties to do. 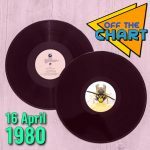 Such extra-curricular activities mean we’re deprived of peak Motörhead; in the week the Ace of Spades album entered the chart at number 4, their highest chart position to date, Lemmy & co are here to blaze through their best known song. 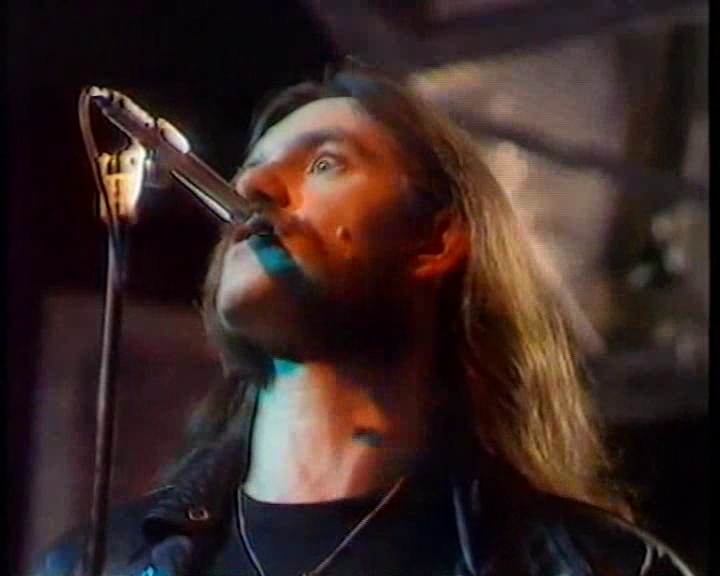 All the classic Motörhead traits are in place: Lemmy’s microphone is, as usual, too high and angled down towards his mouth as he glares directly into camera to deliver the “I don’t want to live forever” line, while the late, great Philthy Animal bashes all hell out of the drumkit while wearing a silly hat. 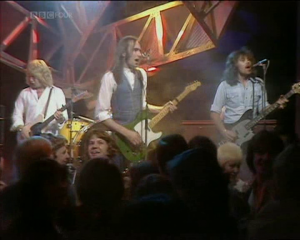 Although it wasn’t their biggest hit Ace of Spades is still the band’s best remembered song, thanks mainly to their appearance in The Young Ones in 1984. Just don’t mention the dance remix to Lemmy or you’re liable to end up with a broken face. 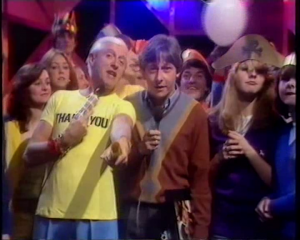 Finally Savile has finished debating and decides to give prizes to both women, beckoning on his associate “Barry The Bag” with a pile of promotional guff which Sir Jim’ll proceeds to distribute between the lucky winners: the top ten singles, some articles of clothing which are probably T-shirts, and best of all a copy each of the new Liquid Gold album. Stop, please stop. Time for the Top Ten countup, which is a bit of a shambles this week: the name “Orchestral Manoeuvres In The Dark” is clearly beyond Savile’s linguistic expertise, so he doesn’t even try; the TOP TEN TOP TEN TOP caption gets mysteriously switched off and on seemingly at random; Adam and the Ants and Bad Manners are represented by still photos instead of clips, while Special Brew gets its own title caption but Dog Eat Dog doesn’t. That’s about as far as we can go this week, as whoever was thoughtfully taping the show on its first broadcast has discovered that Barbra Streisand is still at number 1 and switched off in disgust, but we can assume that the bizarre montage of photos and film clips was shown again. What would be a good song to play out on? Why, John Lennon’s (Just Like) Starting Over, of course. That’s TOTP logic for you.